I’m sitting 11 000 meters in the air, over the Siberian tundra writing this post, if someone told me ten years ago that I would be able to do that, I would probably have laughed. Technological advance often goes quicker than we can imagine and it also opens up opportunities for substantial new revenue streams. One such area is how mainstream gaming has become. About 20 years ago when I was a kid growing up, playing NES, early PC-games like Prince of Persia etc, gaming was definitely not mainstream – it was something mostly nerds did. And it kind of stayed nerdy when internet and multiplayer gaming started. We nerds played games like Warcraft, Starcraft, Quake and Counter-Strike. Then around the time when Playstation 2 had gained some traction, something in our society started to change – gaming started to be cool and the gaming industry grew enormously. With the entrance of smartphones the world was ready for the next level of gaming – suddenly even our mom’s became gamers, playing Candy Crush in the subway on their way to work. I think we all can agree that games in our daily lives through PC, Consoles and Phones are here to stay and most of us are willing to spend a few dollars now and then for this entertainment. Throughout the years I have always been impressed with Blizzards game making, in the same way as Nintendo they built a whole world of characters that they re-use in all kind of games. It has become so big that they are just launching a Warcraft movie (I’m watching it tomorrow). In my opinion they also deliver products with immense quality. Blizzard was bought by Activision and one way to gain exposure to their games would be to just invest in Activision Blizzard, but I think I have found a perhaps riskier but better way to play the investment and that is through NetEase. Let’s see what type of company this is. Although listed in the US, NetEase is almost a purely Chinese internet technology company. 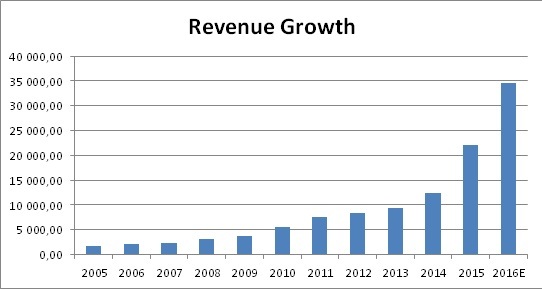 It’s by far biggest revenue stream is from games but it is also owns a big free E-mail service, Internet Media pages and has lately expanded its revenue into e-commerce of various types. Over the years they have created several popular MMORPGs (Massively multiplayer online role-playing game) for PC. These games have been purely for the Chinese mass market. Later NetEase has added both mobile games as well as several partner companies which they distribute games for. Given the type of games NetEase had previous experience with and how hard it is for a western company to launch games successfully by themselves in China, Blizzard decided to team up with NetEase to launch their games through a joint Venture agreement. Although Blizzard after a few years of trying out NetEase could have changed their partner in China, they actually seem very happy with the partnership. NetEase is definitely their platform for releasing all their games in China by now. Another proof of NetEase professionalism came last week when Microsoft/Mojang the owners of Minecraft announced that Minecraft will be released through NetEase platform in China. This was done under fierce competition with other big players as Tencent and probably NetEase did not get as good of a deals as with Blizzard, but it goes to show that NetEase is the preferred choice of partner for western game producers when they want to launch their game successes in China. A compelling valuation and their track-record on ability to partner up, is why I like NetEase so much. Why is this so important to me? Because buying a game maker is always risky, will they be able to reproduce their previous successes? With NetEase you get the regular game development, but you also get the partnership, where they can free-ride and sometimes even cherry pick the games that are already huge successes outside of China. Lastly, they have access to what I believe is one of the highest quality game makers in the world – Blizzard. In my very personal opinion I believe Blizzard’s type of games are perfect for the Chinese market, just see how popular Starcraft is in Korea. As a starting point we can start to look at some simple metrics and compare NetEase with Activision Blizzard. Let’s have a look at the long-term track-record of Earnings in million CNY. In my valuation assumptions key parameters is of course the future growth of revenue and the margin, I have made the following assumptions of yearly growth in Revenue and Operating Margin. Base year is end of 2015 is actual level of operating margin and first year is 2016, where we already have an indication of earnings through the Q1-2016 report that has been released. I use very moderate assumptions about future growth, compared to historical levels and also a significantly deteriorating operating margin. My valuation model then spits out a fair value of NetEase at 225 USD per share, a healthy premium to today’s price at 175 USD. And this is with a fairly conservative assumptions about growth, a more blue sky scenario which extrapolates their track-record into the future gives a valuation of about 350 USD per share. It seems the company is putting a lot of cash into it’s e-commerce business, which at the moment has very weak margins, it’s almost as they have used 2bn RMB cash to get a 2bn RMB growth in Revenue from this segment, one can just hope this is will be money well spent for the long-term, right now I would have preferred NetEase to stay a more pure-play game maker. So we can expect about US$100 million per year in stock based compensation, as long as this figure does not keep rising, it is still not a major alert. I have followed NetEase for about 2 years, the company does seem to have been recognized by investors, since when China stocks crashed and most Chinese listed ADR’s got hammered in the US, NetEase kept up pretty well. When Minecraft choose NetEase as it’s partner it was a sign for me to put NetEase as a high conviction position in the my portfolio. I rate it as a strong buy in the medium-term, long term is harder to predict with this type of companies, as well as the state of things over in China. You do run some serious China exposure with this type of holding, although I believe it is actually the perfect way to play the Chinese consumer, at lower multiples than you have to pay for a consumer staple. It’s a strong buy for me and maybe also a buy-out candidate for the biggest rival and game-maker in China the gaint Tencent.